Have you ever wanted to fly through the air, balance on one hand or twist through the air and still land on your feet safely? Gymnastics is the ultimate sport to test the limits of your mind and body, while having fun. Gymnastics is the nursery of Australian sport. It develops the skills of fundamental movement, confidence and competence, and it provides the foundation for future sporting success and lifelong, active and healthy participation in physical activity. It keeps you fit and provides you with the skills of control, flexibility and strength which means you can leap and jump and perform tricks like no other. Gymnastics is the name for a whole range of different Gymsports , or disciplines. These include those gymsports you may have seen on TV at the Olympic or Commonwealth Games such as Men’s and Women’s Artistic Gymnastics (the one where the men show super human strength on Rings and the women do summersaults on the Beam), Rhythmic Gymnastics (the one where they throw a ball, hoop or clubs in the air while spinning, and catch it), and Trampoline (where they jump as high as the roof). Gymnastics also includes Acrobatic and Aerobic Gymnastics , as well as Gymnastics for All - an all-encompassing gymnastics discipline for people of all ages, gender and ability. Do you practice cartwheels and handstands in the school yard? Or tumble on your back lawn and hang from the clothes line? These sorts of activities are based on the foundations of gymnastics and are probably already a part of your everyday life. With support and training, you can continue to build on your skills and explore the full range of gymnastics. We have programs that can support children from zero to 12 years of age to start gymnastics, right through to adult classes. Visit our LaunchPad page for more information or contact your nearest club. How many people already do gymnastics? More than 239,000 people participate in gymnastics at 627 clubs across Australia, delivered by over 8,000 registered coaches and judges. Gymnastics really is for everyone. No matter your age, gender or ability, there is a Gymsport that you can try today at a club close to you. Many gymnasts even change between Gymsports throughout their careers. It’s all about getting started and finding what you really enjoy. There’s nothing better than having fun while you get fit! Who else can participate in Gymnastics? If you're interested in being a part of gymnastics, but don't want to compete, you may be interested in becoming a coach, or a judge, or even volunteering at events. Read more about being a coach and a judge, and to become a volunteer email the Gymnastics Australia events team at events@gymnastics.org.au. How do I become an elite Gymnast? Becoming an elite gymnast is a process which takes a lot of dedication, determination and commitment. The best way to get to elite level is to start at your local club today. 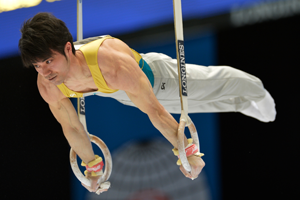 From here, you can progress through a program of gymnastics levels and assessments associated with your age and if you’re identified as having talent in the sport, you may be invited to participate in an accelerated training program which is part of the Gymnastics Australia high performance pathway. Elite gymnasts train at the many high performance clubs and training centres around the country and come together at national training camps before events such as World Championships and Olympic Games. Take a look at some of our elite athletes and learn about their journey to competing nationally and even representing Australia in international competitions here. Getting started is as simple as using our club finder to find your nearest facility and going along for a trial session.